(Nanowerk News) NANO KOREA 2013, the world's second largest nano-convergence EXPO, will be held on the third floor of COEX in Seoul for three days from July 10 th (Wed.) to the 12th (Fri.). Co-hosted by the Ministry of Trade, Industry and Energy and the Ministry of Science, ICT and Future Planning, and organized by the NANO KOREA Organizing Committee, 'NANO KOREA' is an international event for showcasing advances in the nano-convergence industry. This special expo has been held every year since 2003. The theme for this year's exhibition will be 'Nanotechnology, Pioneer of Next Generation Industries.' Five separate exhibitions will be set up to showcase advances and industrial aspects of nanotechnology. Significantly, no fewer than 350 domestic and foreign companies representing every field of nanotechnology from special materials, devices and systems, to processing, manufacturing, measuring, analysis and applied products will showcase how far nanotechnologies have advanced. In addition, four special exhibitions will be set up each with a focused theme. 'MICROTECH World' will introduce Korea's state-of-the-art micro/MEMS technologies, 'LASER KOREA' will be exhibiting laser technologies utilized in a wide range of fields including displays, semiconductors, electronics and automotive applications, and the 'International Advanced Ceramics Exhibition' will showcase advanced ceramics, a material of the future that provides key functions for the NT, IT and BT industries. New for this year will be 'PROTOKOR 2013.' This is Korea's first exhibition to feature prototyping technologies. Here visitors will be treated to displays showing all the elements of prototype design and manufacturing that are happening in small-scale nanotechnology companies. This special exhibition will provide a venue for various prototype manufacturers in addition to companies manufacturing various design tools, processing equipment and testing devices to form networks with technology suppliers and potential customers. In particular, this year's expo will feature a 'Nano-Convergence T2B Products' pavilion and 'Printed Electronics' pavilion, both of which will surely appeal to general spectators as well as industry insiders. At the 'Nano-Convergence T2B Products' pavilion, around 90 nano products from 75 companies specially recognized by the Ministry of Trade, Industry and Energy will be featured according to their industrial field. The 'Printed Electronics' pavilion will showcase the latest technologies of Korea's printed electronics industry and focus extensively on the current status of the industry. Both of these pavilions will provide an opportunity for general visitors to more easily understand how nanotechnology is applied to products used in everyday life while also functioning as a bridge connecting businesses in need of the products and exhibitors wanting to exchange information or even to close sales. At the NANO KOREA Symposium will be offered lectures by 73 guests from 12 countries as well as no fewer than 851 oral and poster presentations. 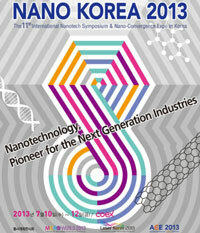 The symposium will be one of the key events of NANO KOREA 2013. As a high-quality international academic event, this symposium will be a venue for discussing visions for nanotechnology innovation and industrialization and seeking directions for R&D to be pursued in the future as well as an opportunity to publicize the importance of nano science and technology to the general public. "NANO KOREA is advancing continuously each year. We expect that around 12,000 people will visit from 40 countries and that NANO KOREA 2013 will function as a comprehensive business platform where participating companies will achieve technical cooperation and business success in various fields," said a NANO KOREA Organizing Committee insider. "We will improve the exhibition and business-related programs for greater satisfaction of participating companies and visitors to the exhibitions, and are doing our utmost for the success of this event. We ask for interest and support from participants and visitors." For more information visit: www.nanokorea.or.kr. Pre-registered buyers planning to visit the booths of specific companies are advised to use the '1:1 match-making system' to get the most out of their stay. Visitors wishing for a free tour of the exhibitions need to complete advance registration online through the website by July 8 (Mon.). Persons who apply in advance are allowed concurrent admission to NANO KOREA, MICROTECH World, LASER KOREA, International Advanced Ceramics Exhibition and PROTOKOR 2013.